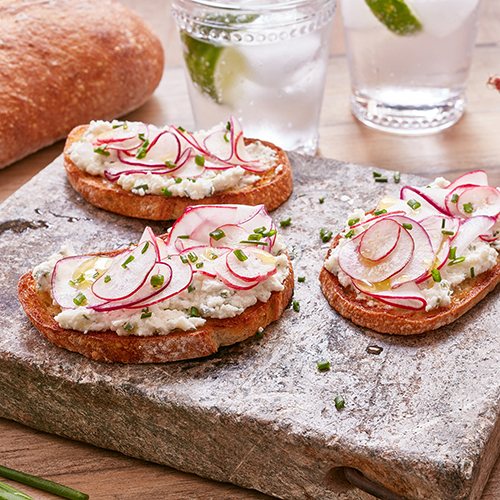 Not only is our Herb de Provence Pave unlike any other you’ve tasted, it’s something upon which one of the most surprisingly delicious treats depends upon - the Rainbow Radish Ricotta Tartine. Radishes may not be the first thing that comes to mind when you think “sandwich” – but that’s about to change. Tart, tangy, tasty, and terrific describe what happens when Ricotta, lemon, chives, and tarragon unite atop a slice of our Herb de Provence Pave. Unusual, unexpected, unstoppable? Yes, but so was the internet when it arrived, and looked what happened there. Slice bread into ½ inch thick slices and toast or grill. Arrange radish slices on top of ricotta and drizzle with olive oil. Sprinkle each tartine with chives and sea salt. Enjoy! *If rainbow radishes aren’t in season, use regular red radishes.